This year, as a joint birthday gift for Sandra and I, our good friend An surprised us with a trip to Mildura and dinner at Stefano's! WOW! 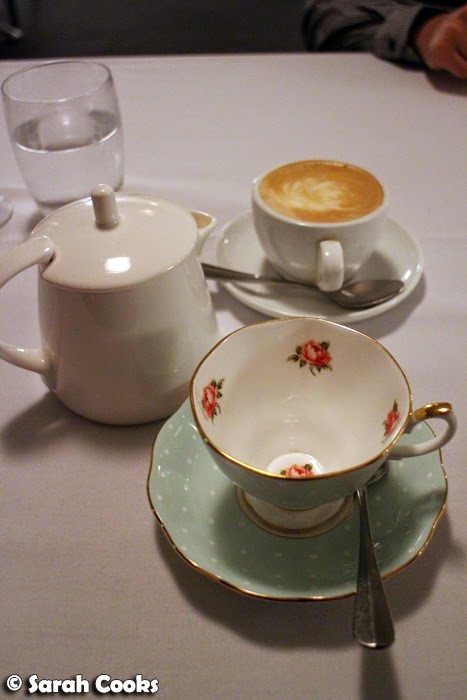 I'll do a separate post with impressions of Mildura (it was only a short trip), but today's post is all about the wonderful meal we enjoyed at Stefano's. 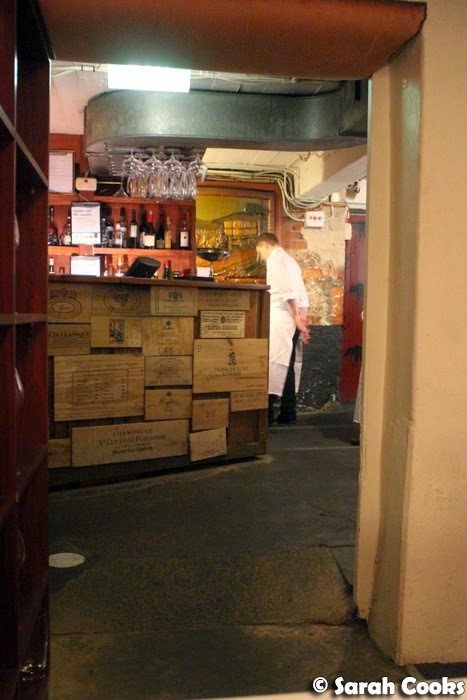 Stefano's is located in the cellars of the Grand Hotel, and you have to walk through another (unrelated) restaurant to get to it. 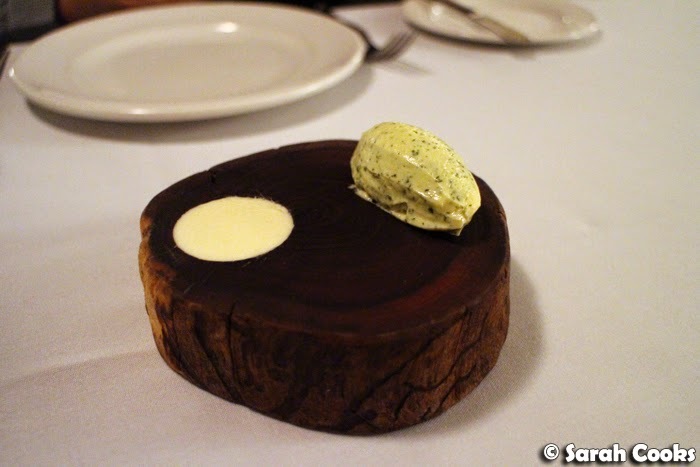 Two butters were provided on the tables, presented in this super cute natural board. In the hole we have whipped truffle buttermilk, whilst the quenelle was house churned butter with saltbush and Murray river salt. Both were excellent, but I preferred the unusual taste of the saltbush. 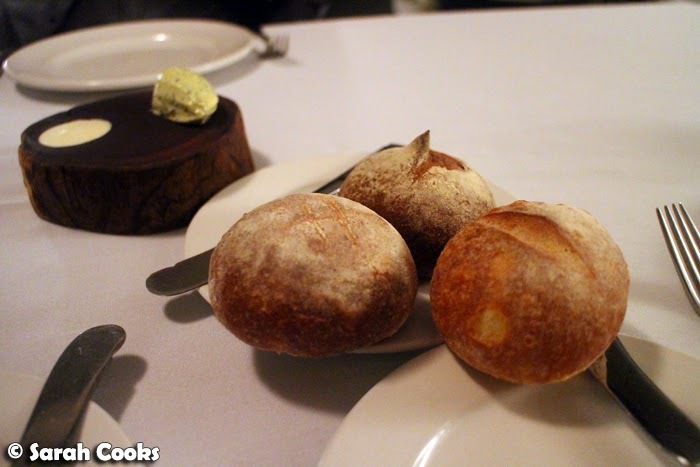 On offer were three types of really great house baked bread rolls - sourdough, beer and olive. 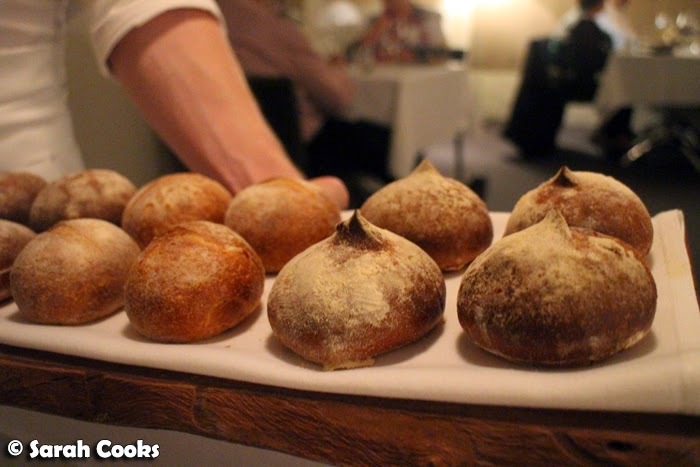 With an eight course meal on the way, I probably shouldn't have indulged in bread, but it was seriously good and throughout the evening I ended up trying them all! So, onto the menu. As per usual, Sandra went for the vegetarian degustation, whilst An and I did the standard one. An insisted I get the matching wines, so he "could taste them all". Well, I wouldn't want to be ungracious...! 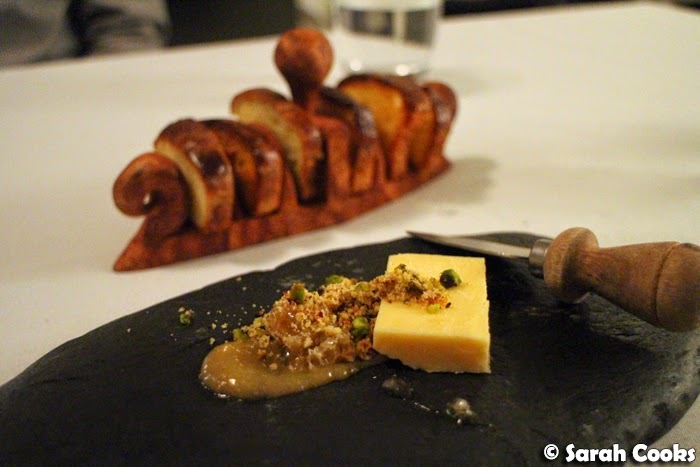 At the end of the evening, we were each given a little menu card with details of all the courses, but in between the dinner and writing this post I seem to have lost the card with the vegetarian degustation on it! D'oh! 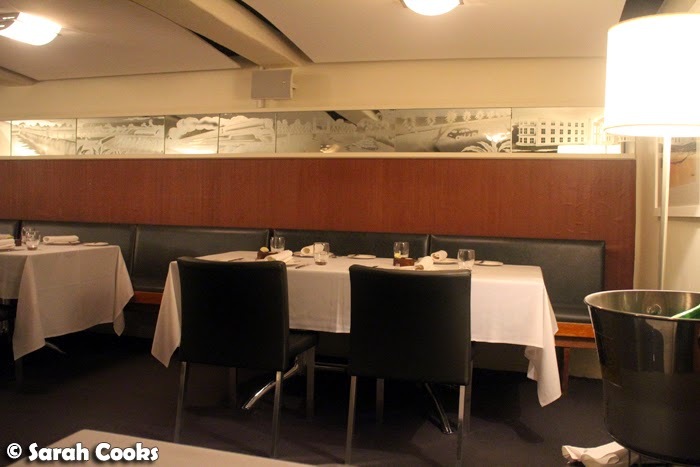 I did email the restaurant to see if they could provide one, but unfortunately they no longer had a record as "the chef specifically prepared it for one person that night". (Ooh, special!) I'll endeavour to describe the vegetarian meal as best as I can, based on my hastily scribbled notes, photos and memory. Please excuse me if there are some mistakes or omissions! 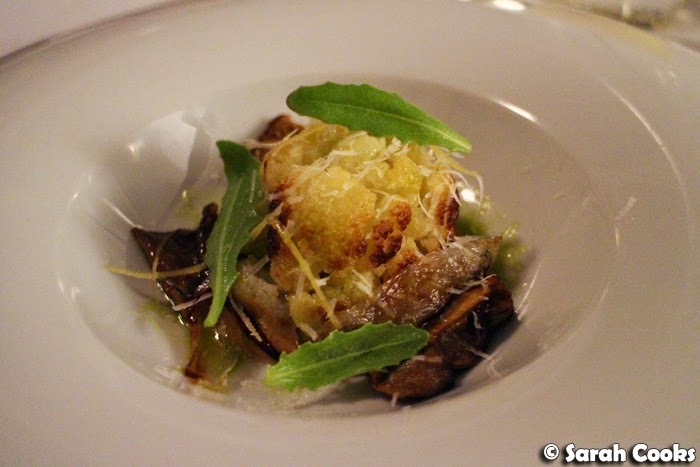 For any vegetarians thinking of visiting Stefano's, Sandra did say that she greatly enjoyed the vegetarian degustation, that it was a well balanced menu, and that she didn't feel like she was missing out or getting a lesser option for choosing it. The charcuterie amuse was a really cute way to show off some local produce. 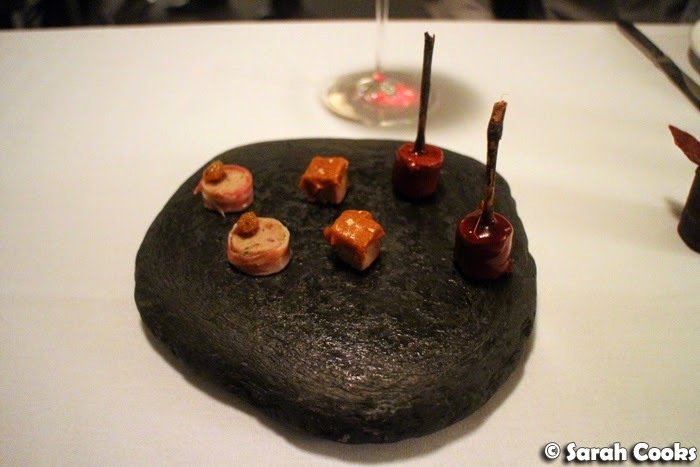 Each element had a bit of a salty-sweet mix, which I liked, especially in the caramelised goats terrine. Normally I'm not a fan of jerky (or biltong or anything similar), finding it overly salted and tough, but Stefano's version was pleasantly chewy and the salty taste didn't dominate the beef. 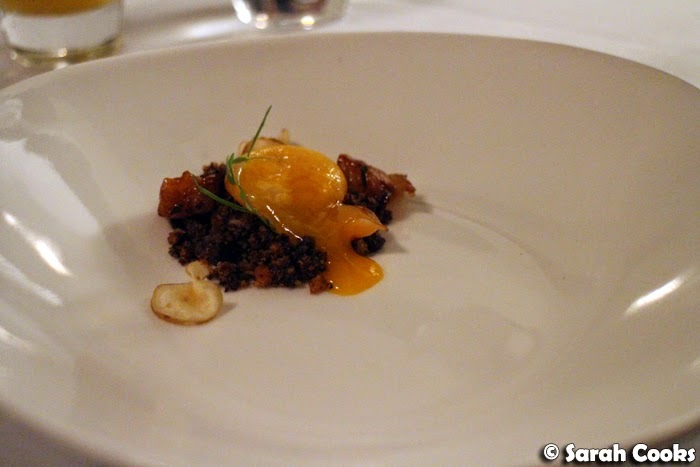 The vegetarian "charcuterie" option was all based on pumpkin, and the highlight was the very tasty pumpkin puree with Mildura sultana. 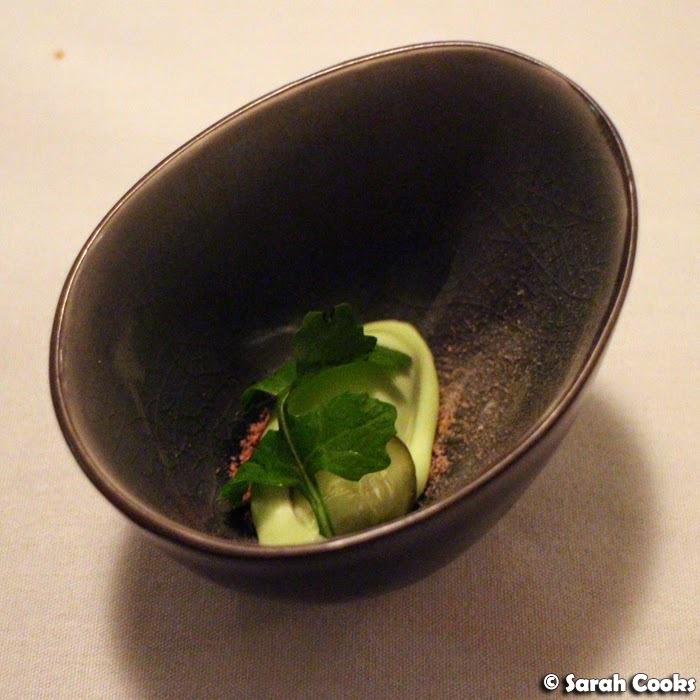 I was very impressed by the cod liver parfait, finding it mild tasting and very, very smooth. I loved the sweetness from the thinly sliced grapes too! 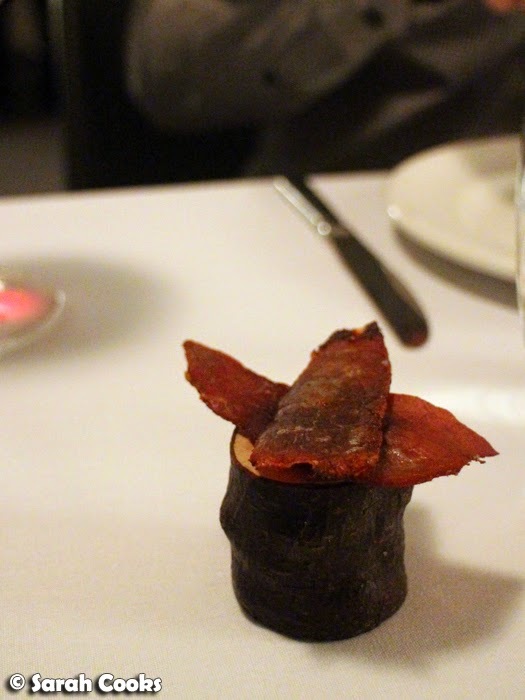 The vegetarian option (not pictured) was "Variations of Beet" - beetroot puree, pickled beet and yarrow leaves, presented in a similar way to the cod liver amuse. Our first proper course was a kangaroo carpaccio, presented beautifully on a natural block of salt. We were told that the longer we left the meat on the rock, the saltier and more "cured" it would get, so it was interesting to compare the first slice to the last one. I was expecting the carpaccio to be a bit tough, but it was actually meltingly tender and soft. 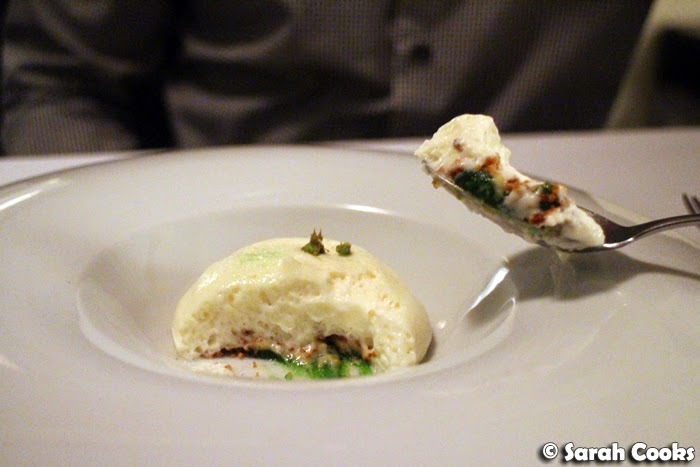 With the kangaroo came a small quenelle of wild mustard ice-cream, which had a nice sharpness without being overpowering. To me, the combination felt like an elegant take on the classic beef-and-mustard combination. The accompanying wine, the rose, was quite refreshing and acidic with some fruity aromas - a great way to start the meal. 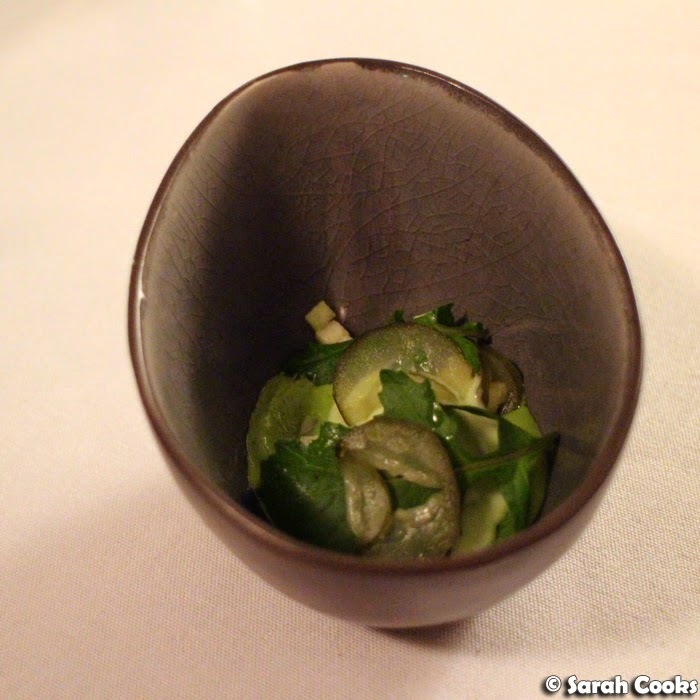 The vegetarian option was a slightly larger portion of the wild mustard ice-cream, beefed up (for want of a better word) with extra accompaniments - pickle slices, rocket leaves and so on. 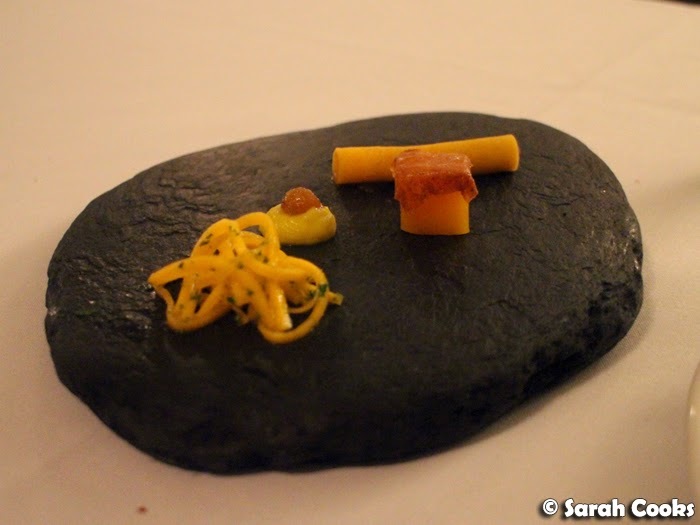 The second course was one of our favourites that night! 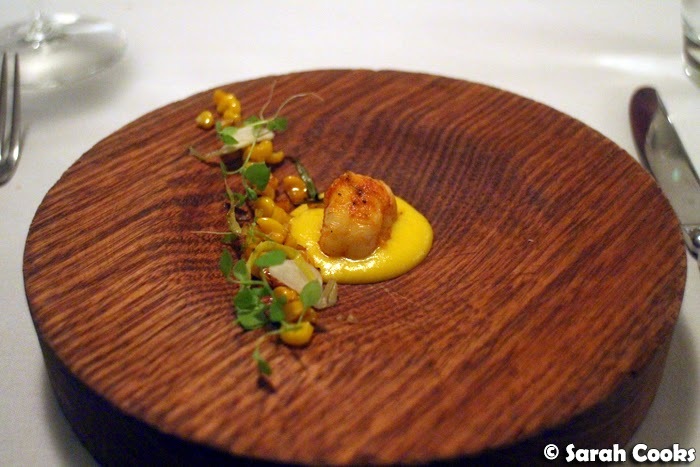 A very fresh and meaty piece of barbecued yabbie sat atop a bright corn puree - it was fun, it looked beautiful and it was perfectly executed. Delicious! The vegetarian option was quite similar, but (obviously) without the yabbie and with some extra vegetables. 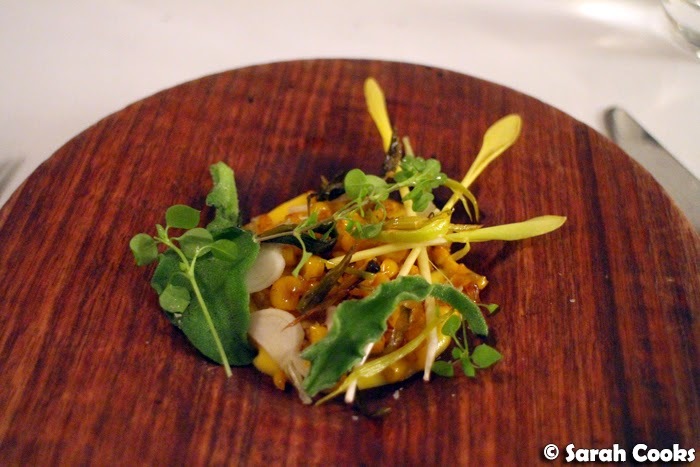 It had a similar flavour profile, and was also one of the highlights of the vegetarian degustation. The accompanying wine, the 2013 Rieslingfreak Riesling was described as a typical "Clare Valley riesling". Now, I have to be blunt and say it wasn't to my taste at all. I actually found the aroma and taste to be similar to newspaper! I think that's one of the great things about doing matching wines with a degustation, though - you get to try a whole lot of different wines that you might otherwise not think to order, and if the sommelier is good, I find it quite an interesting and educational experience too. Now we come to a bonus course - our waiter informed us that when the chefs put the menu together, they had one too many but they couldn't decide which one to leave out, so us lucky diners got a bonus course! Now, time for some #yolkporn! Once pierced, the yolk oozed over the pile of crumbs below to create a rich sauce, with a heady truffle aroma coming through too. It's not like you need me to tell you this, but eggs and truffle are an amazing combination. No picture of the vegetarian option, as it looked exactly the same. (Apologies, I can't remember what, if anything, they replaced the chicken liver with). The matching marsala had a rich aroma, and I expected it to be quite sweet, but when I took a sip it actually wasn't sweet at all. Bit of a head trip! It also had a walnutty taste - I loved this one. 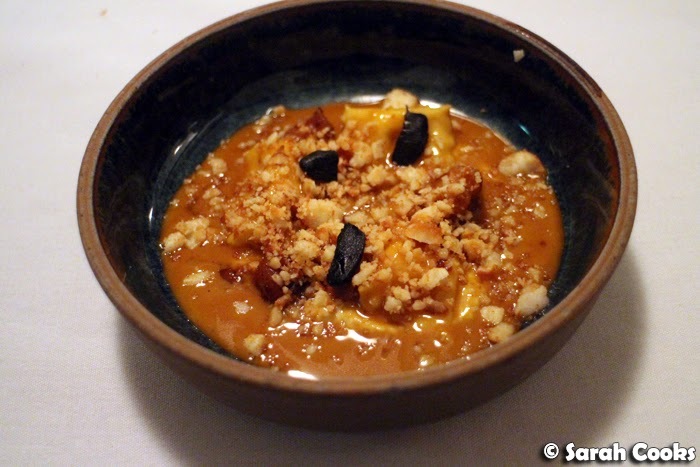 The third course, of smoked sheep's cheese agnolotti with smoked butter, sweetbreads and black garlic, was also a standout, for both the dish and the wine. The sauce was very rich and creamy, and the small portion was just right. I love Chardonnay, so I was looking forward to this wine match, and it was really good. My hastily scribbled down notes for the wine were simply: "Yering station chardonnay - YUM". It had that buttery Chardonnay taste that I love, and it stood up to the strongly flavoured pasta. (Note to self: buy some of that wine next time I'm in the Yarra Valley). 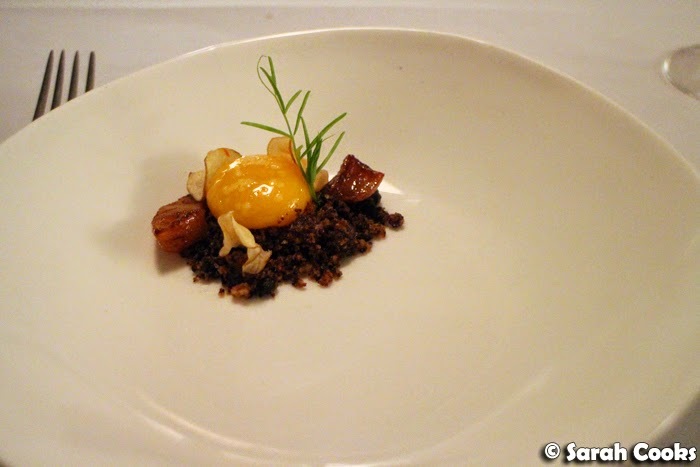 Similar to the previous course, the vegetarian option looked exactly the same, so I won't include a picture. 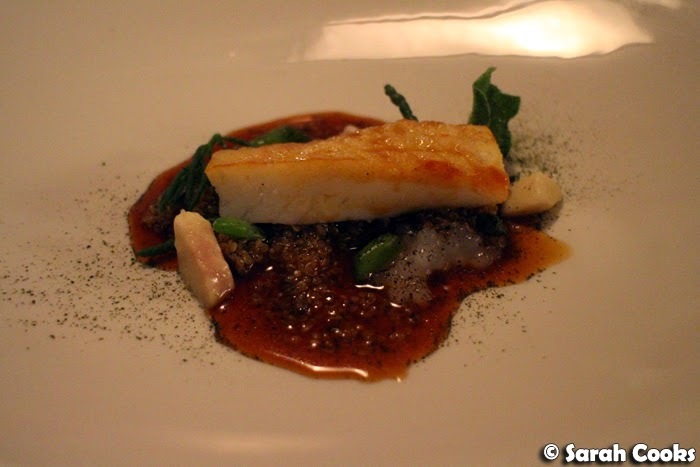 Our fourth course featured more of that Murray Cod, which we were duly informed were delivered live to the restaurant and killed using the Ikejime method. (I had no idea what that meant, but subsequent Google research has taught me that this Japanese method is the fastest and most humane way of killing fish, which also maintains its quality and appearance). The fish in this instance, was cooked to perfection, flaking apart at the press of a fork. Underneath were a mixture of sea plants (including, I think, samphire), quinoa, bone marrow and a savoury jus. For the wine match, we stayed in the Yarra Valley, with a Toolangi Estate Pinot Noir. I wouldn't have thought to match red wine with fish, but the bone marrow and jus were quite rich, and it worked well. 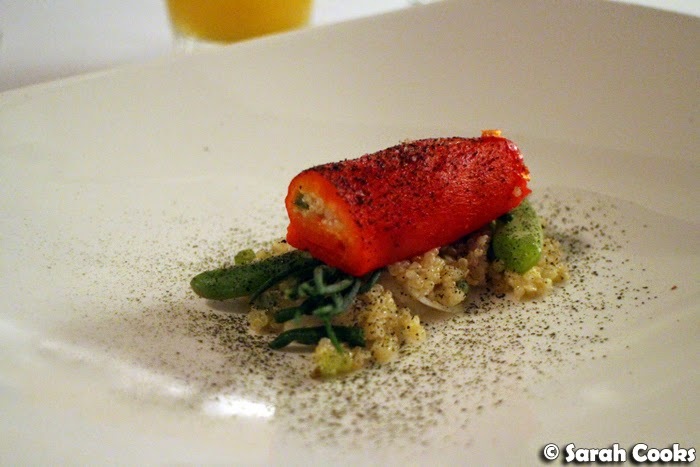 The vegetarian option kept the quinoa and sea plants, but omitted the jus and replaced the fish with a rolled and stuffed piece of roast red capsicum. Pretty! 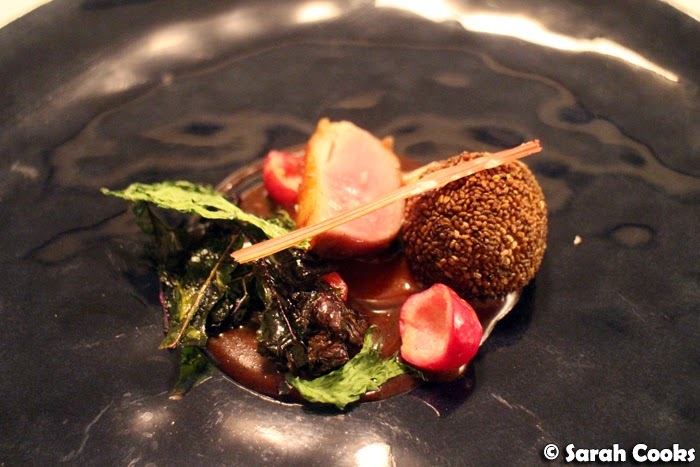 The duck dish included a piece of rare roast duck breast, and a duck mince ball coated in chia seeds. The little red fruits were lilli pilli - native Australian fruits which were crunchy and sweet. The brown sauce beneath was a roast malt polenta, but it really, really tasted like chocolate! 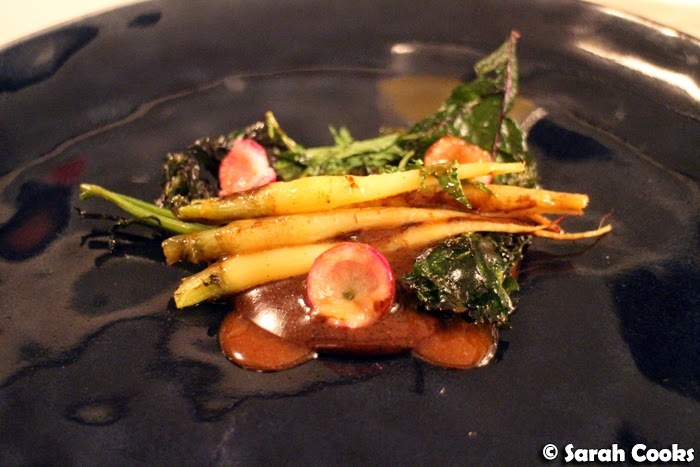 This dish was another winner - the rich, fatty duck against the sweet fruits, the slightly crisp dried greens and the creamy rich sauce - an unexpected but delightful combination of flavours and textures. 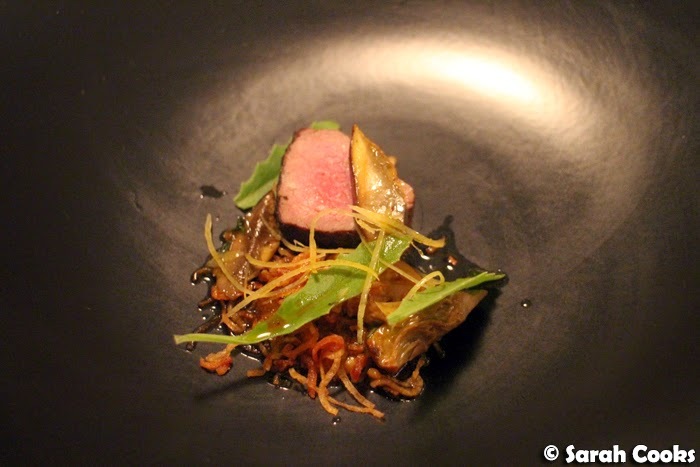 The wine match was a Ravensworth 2013 Nebbiolo (which is by the same owner as Clonakilla), which was chosen for its fruitiness and its ability to complement the duck. For the vegetarian option, the duck was replaced with roast carrots, and - hooray - the roast malt polenta sauce and lilli pilli remained. As you can see, the beef in this dish was cooked to a lovely pink, with the savouriness of the beef lifted by the bright additions of river mint and pine. I had never tried Lagrein, but it is a variety of grape from South Tyrol (aka Alto Adige or Südtirol), which I'm told is a primarily German-speaking region of northern Italy (close to the border with Austria). The wine itself was slightly tannic with quite fruity flavours - as a wine noob/enthusiast, I thought of it like a less in-your-face version of a Barossa shiraz. The vegetarian option was based on roast cauliflower - pretty and delicious. Between the savoury courses and dessert, we received these chocolates. 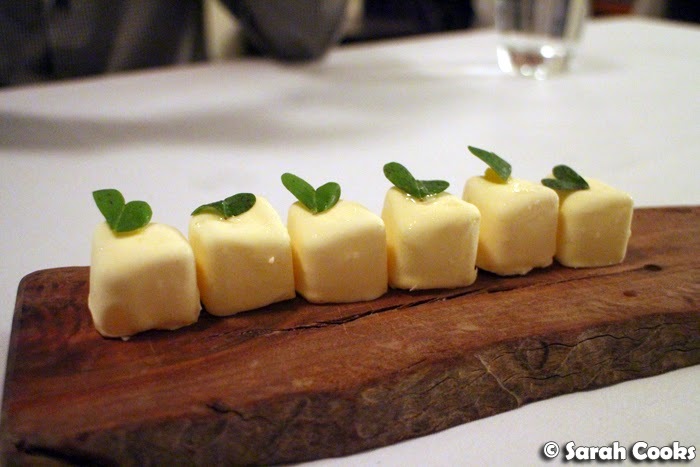 Inside the white chocolate casing was a very sharp liquid citrus centre. Warning - eat these in one mouthful or things will get messy! We quizzed our waiter, and apparently the chefs freeze the citrus filling in little cubes, then dip the cubes in white chocolate. By the time it comes up to fridge temperature, the filling has become liquid, safely enclosed in the white chocolate. So cool! The first proper dessert was a light-as-air buttermilk panna cotta. The airy, airy foam concealed the strongly flavoured lime, basil and crunchy caramel - so pretty, so delicious, and just right after such a long meal! The accompanying wine was a sweet riesling - what I'd think of as a typical dessert wine - which was quite citrussy and fruity. Very, very different from the Clare Valley riesling we'd had earlier in the evening! 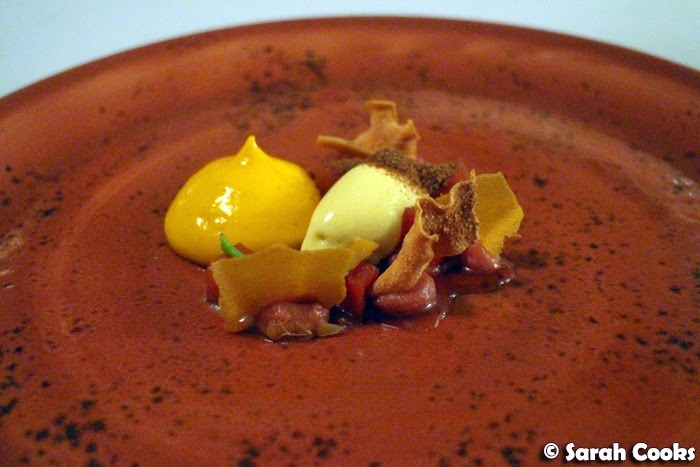 I loved the autumnal colours of the final dessert. 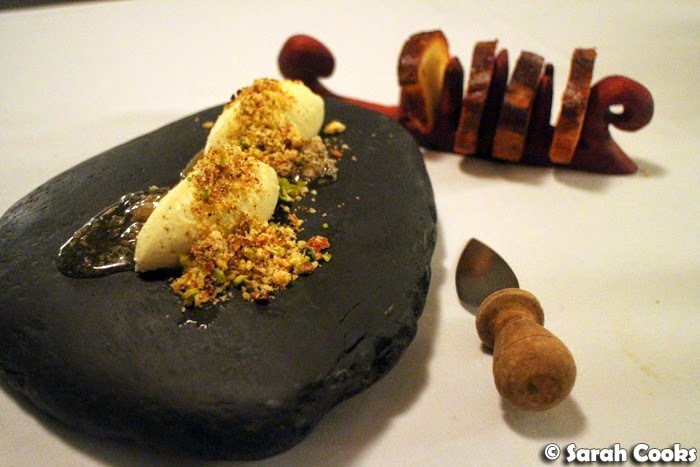 The roast quince came with spiced ice-cream, carrot mousse, apricot and crunchy little biscuity shards - fabulous. We all mentioned that if we'd seen this item on a menu, we wouldn't have ordered it ourselves, but we really liked it, and were glad that we were "forced" to have it. I have to say I wasn't a fan of the accompanying plum wine, but that didn't diminish my enjoyment of the dessert. 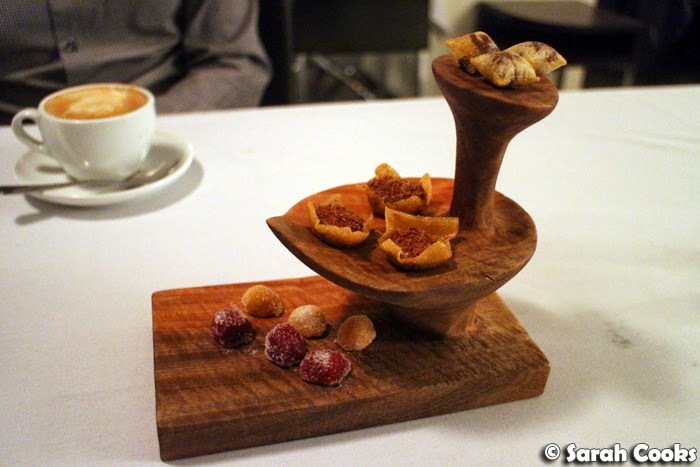 Petits fours came presented on an unusual yet pretty tiered board. From the top, we have nutella-filled potato pockets (think like potato chips), lavender and caramel tartlets, and intensely fruity jubes. So that was the dinner at Stefano's! It was a seriously amazing meal, and we couldn't fault anything. Yes, there were a couple of wines that didn't suit my taste, but that was down to personal preference and not quality. 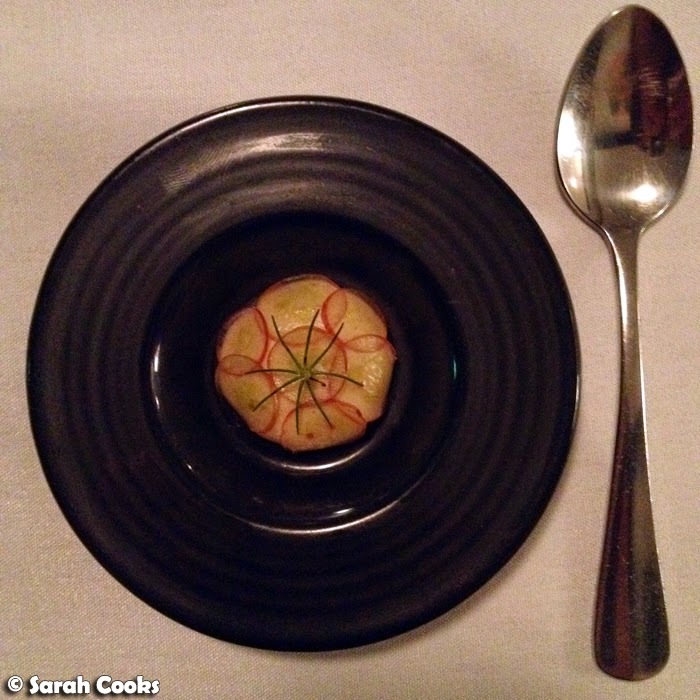 So many of the courses were inventive and delightful, and all were really skilfully executed. Service was switched on and professional, and we were made to feel welcome and at home. You can see above that the bread waiter kindly posed for me when I asked if I could take a photo of the bread, and the wine waiter presented the wine matches with the same level of enthusiasm to every table in the restaurant. (Pretty much every table opted for the wine match). The eight course degustation is currently priced at $135 per head, with matching wines available at $85 a head, which is actually cheaper than some of the other degustations our little group has tried - most seem to be around $180, and without naming names, there are some other, more expensive degustations we've tried that weren't nearly as good as Stefano's. 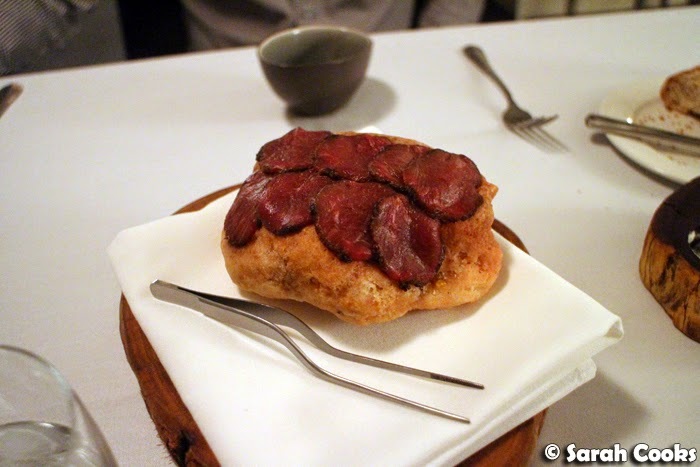 (For me it's a very close call between Stefano's and Tetsuya's, which is my current favourite, and the standard by which I judge other restaurants with a similar offering). Thank-you so much to An for the generous gift and the fantastic suggestion!!! I can never resist housemade sourdoughs either - that chewy crust! Yum! And how gorgeous is that petit fours stand! What a wonderful meal! I've been to Mildura once before, but didn't have the chance to try Stefano's. It looks just gorgeous.